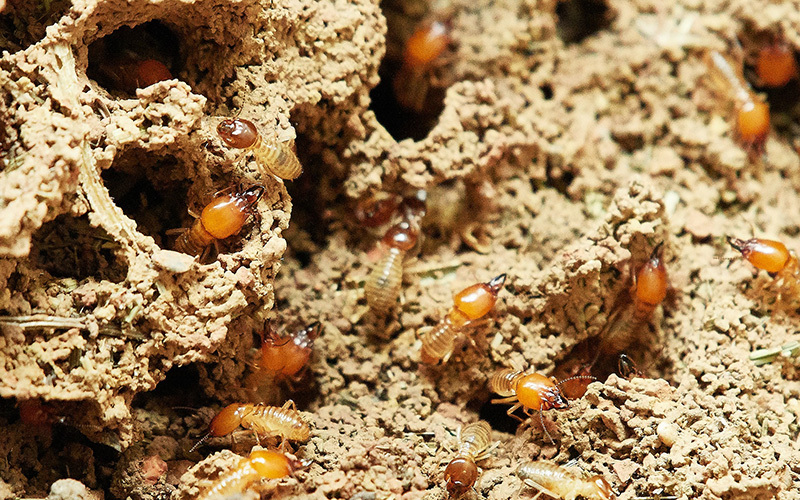 Termites represent one of the costliest types of pest infestation for homeowners. A termite colony of 60,000 workers has the potential to devour approximately one cubic foot of wood a year. Left unchecked, this eventually leads to severe damage to your home, and unlike ants or other insects, termites lack territorialism. This means that colonies live near eachother without issues — increasing the amount of wood damaged. Most worrying, by the time you notice the colony, they have likely been sharing your home for years. Discarded Wings are one of the earliest signs that termites have moved in. When a colony reaches a large enough size, part of the colony will swarm to create a new colony. If you observe a swarm, this generally means that a well-established colony already exists nearby. When you notice discarded wings on windowsills or floors, there is a good chance that they have found their new home with you. Catching this early presents you with the opportunity to not only stop a forming nest but eradicate the original nest that caused the problem. Mud Tubes are also a sign that termites have taken up residence. Termites have thin skin requiring a humid environment or they dry out and die. This need for humidity also explaining why colonies often begin in basements or cellars. From there they begin spreading throughout the rest of home. When traveling for food, they will build long tubes to maintain this humid environment easily seen over concrete foundations. Breaking of a section of this tube offers a good way to determine if the colony is active. If termites don’t emerge immediately, return the following day and check if the tube has been repaired. Damaged Wood often represents the most difficult signs of termites to detect being placed behind drywall. One way to check for wood damage requires only knocking on studs behind the drywall while listening for a hollow sound. Additionally, check support beams in your basement for maze-like patterns created when termites eat. The best way to protect against termite infestation — make sure your home and property undergo annual inspections by a pest control expert. Using the proper tools and experience, they help to detect and remove colonies before the termites cause severe damage. For more information about termite infestation from the experts at Smitter Pest Control, please contact us here or call us at directly at 616.245.7215.